56 HENRY is pleased to present 1076 Madison, an installation of new work by Cynthia Talmadge. The exhibition will be on view from November 2nd through January 20th, 2019. 1076 Madison marks Talmadge’s second solo presentation at 56 HENRY. 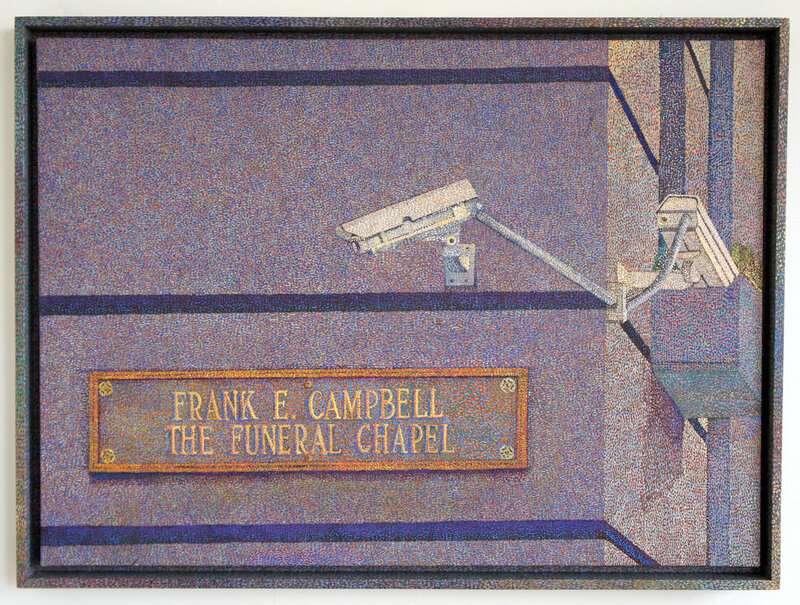 On view in the gallery is a series of eight new paintings by Cynthia Talmadge, each of which depicts New York’s best-known funeral parlor, Frank E. Campbell, whose simple motto – “The Funeral Chapel” – belies its self-conception as the only place a member in good standing of New York society would be caught actually dead. 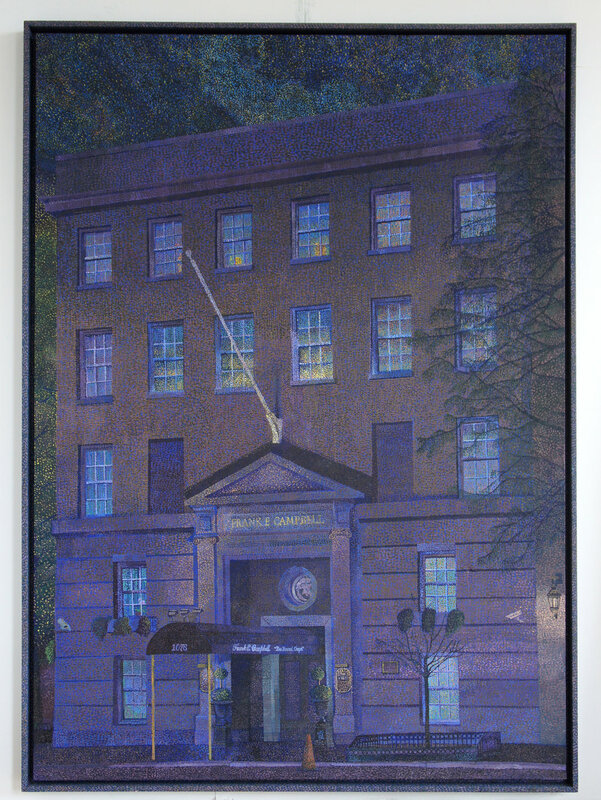 Rendered in a laborious pointillist technique, Talmadge’s works describe the building’s exterior from a number of vantage points, using a variety of seasonal lighting and weather conditions to drench its façade in drama and ceremony. 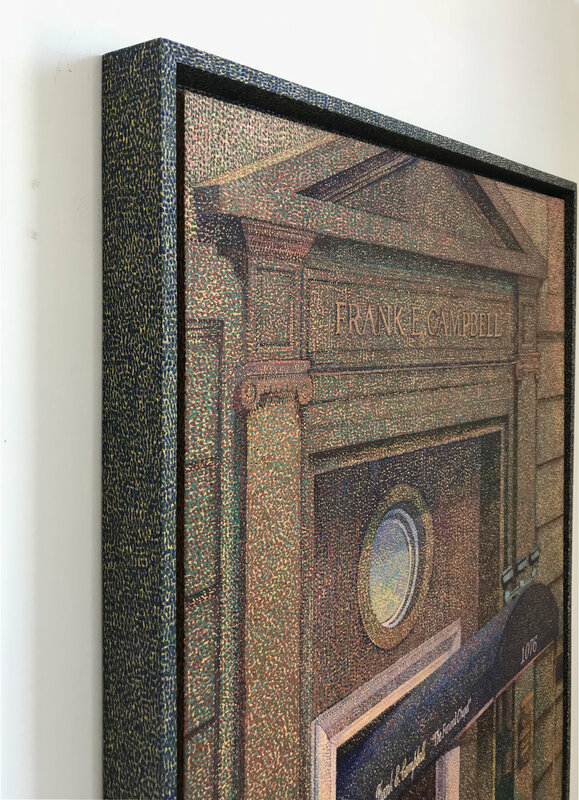 Variously seen under the sun of high noon, in the saturated hues of the “golden hour,” and through a veil of falling snow, Frank E. Campbell is transposed in these paintings, from the site of a memorial service to the position of the memorialized subject. 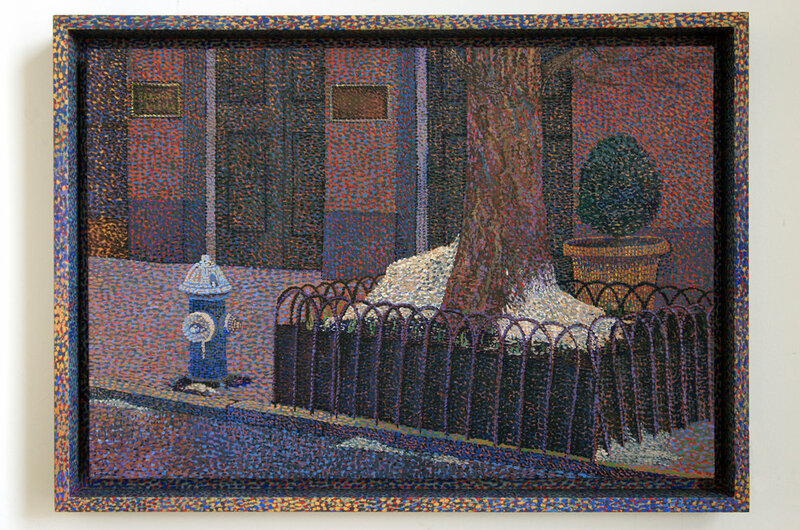 Where Neo-Impressionist painters like Georges Seurat, Paul Signac, and Henri-Edmond Cross once developed Pointillism to render familiar Parisian scenes through a radical “scientific” engagement with visual perception, Talmadge exhumes the painterly language for its emotional resonance in depicting the grande dame of New York undertakers; in doing so she embraces all the historical, cultural, economic, and camp associations. Pointillism has accrued on its long journey from avant-garde standard-bearer to highbrow decor must-have. Opened to the public in 1898, Frank E. Campbell’s eponymous funeral parlor quickly established itself as the country’s premier venue for high profile funeral proceedings. Upending the tradition of holding funerals in private homes, Frank E. Campbell became one of the first venues in the United States to offer funerary services to grieving families. Housed in an imposing brownstone building at 1076 Madison Avenue, on Manhattan’s Upper East Side, the business grew rapidly as it liberated bereaved families from the logistical complexities of laying their loved ones to rest. Campbell’s notoriety arrived in 1926, when the body of silent film star Rudolph Valentino was laid out for a public viewing. Unbeknownst to Valentino’s family, Campbell hired paparazzi to cover the event, and police were called to hold back the mob of fans swarming the parlor. Campbell reveled in the press his business received, and used the event to position the parlor as the “funeral home to the stars.” Over the years, the chapel became a New York institution, hosting services for many of the city’s elite. Montgomery Clift, Judy Garland, Igor Stravinsky, Candy Darling, Joan Crawford, John Lennon, Tennessee Williams, James Cagney, Rita Hayworth, Irving Berlin, Greta Garbo, Jacqueline Onassis, Biggie Smalls, Aaliyah, Leona Helmsley, Dominick Dunne, Philip Seymour Hoffman, Prodigy, and Lauren Bacall are just a few of the luminaries sent to their reward through Campbell’s doors. Beyond its considerable cultural significance, Frank E. Campbell became a preoccupation for Talmadge after a sequence of recent deaths in her immediate family, and the ongoing observation and continual painting and repainting of the building represent a kind of publicly performed, if self-consciously misguided, exorcism ritual. The doomed-from-the-outset nature of this attempt at catharsis gestures at the value and limitations of our commercial rites – and, perhaps, at the value and limitations of art as well – in the face of actual loss. With the collaboration of acclaimed design firm Charlap Hyman & Herrero, the gallery has been transformed into a space redolent of musty opulence. Taking cues from turn-of-the-century exhibition design as well as from the interior spaces at Frank E. Campbell itself, Talmadge has covered the walls with mossy green silk, festooned the ceiling with crown moldings, and installed gray pile carpet over the floor. Against the lavish and moody qualities of the interior, Talmadge’s paintings hang from traditional salon ropes, as many Neo-Impressionist paintings did in their moment. Taken together, the presentation considers a particular brand of rarified melancholy and explores a strange quiet space on the ethereal outer edge of spectacle. Cynthia Talmadge (b. 1989, New York) lives and works in New York City. Talmadge received her B.F.A. from the Rhode Island School of Design in 2011. Her work has been the subject of recent solo presentations at Halsey McKay Gallery, East Hampton; and 56 HENRY, New York. She has been featured in numerous group exhibitions both stateside and abroad, including recent presentations at Zippora Elders, Amsterdam; Almine Rech Gallery, New York; Monya Rowe, St. Augustine; Aperture Foundation, New York; De Market, Brussels; and JOAN, Los Angeles. Cynthia Talmadge is represented by 56 HENRY. For further information about the exhibition, please contact the gallery at info@56henry.nyc, or +1 (518) 966-2622.